Ken Squier, owner of the Radio Vermont Group, has confirmed that his company is for sale. It's a milestone for a fixture of Vermont broadcasting, held in the same family for 86 years. The heart of the company is "the friendly pioneer," Waterbury's WDEV-AM, founded by Ken's father, Lloyd Squier, in 1931. In recent years, the group has grown to a total of four transmitters plus four lower-powered "translators" that boost a station's signal in weak spots. In an age of mega-corporate broadcasters and national syndication, WDEV is a throwback, still producing the bulk of its programming on-site with a strong focus on serving its community. Squier says he's looking for a buyer that shares his values and commitment. "We're hoping to find a Vermonter or some Vermonters who are interested and dedicated to local programming," he said. "We're unique and special. We don't want someone to take it over and do just another music format." With typical bone-dry humor, he immediately asked me if I was interested in buying. "How big a check would I have to write?" I replied. "None of your business," he shot back, perfectly deadpan. The Squier family has run its stations with an eye on community service — and the other eye on the bottom line. "They need to be profitable, no question," he said. "But we've operated since 1931 in the interest of the public good and necessity, and it's carried us along." WDEV's programming features a local morning show cohosted by Jon Noyes and Eric Michaels; two long-form local newscasts every weekday; the daily public affairs program "Open Mike," hosted by Mike Smith; "The Getaway," an afternoon music show hosted by Arty LaVigne that often spotlights Vermont talent; and live broadcasts of Boston Red Sox baseball. If WDEV is sold, it would also mark the end of an illustrious broadcasting career for Ken Squier, who first took to his father's airwaves at the age of 12. He still anchors a sports broadcast every weekday, plus the legendary Saturday morning staple "Music to Go to the Dump By." Squier is also a member of the NASCAR Hall of Fame for his years of work as an auto racing announcer for CBS and TBS. Squier emphasized that no deal is in the works, and his goal is to find the right buyer instead of making a quick sale for maximum return. 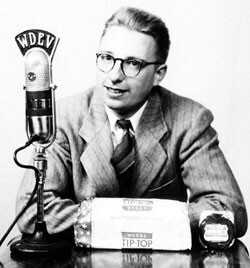 Still, even if he does find a like-minded soul to carry on WDEV's tradition, it'll be a sad day in Vermont broadcasting when the station is no longer operated by a Squier.